In conversations with new recruits, with potential clients, partners, press, we are often met with confused faces puzzled by our inability to limit SSG and our potential to one area of work, one sector, one job. In a description for UBC from a couple of years ago, Director Yuill Herbert charts our trajectory, why and how we do the work we do, why we compete on the threshold of constant change and innovation. All the while keeping our feet firmly on the ground in being held to account not only by our cooperative members but by the grassroots; the communities we work closely with and for. Meaningful change is nothing without their participation and education around the decisions that ultimately matter to them. http://www.ssg.coop/wp-content/uploads/2015/03/Kingston-Writers-Wind-sm.jpg 276 600 Jeremy Murphy http://www.ssg.coop/wp-content/uploads/2015/01/ssg_logo.png Jeremy Murphy2016-03-08 10:55:462016-03-14 18:18:26What is SSG? Thank for listening to Lindsay’s inspiring webinar and fruitful discussion after. Here is the recording for those who missed it and her presentation too. On Wednesday 4th November at 13:00 EDT we have the next in our series of Associate webinars. 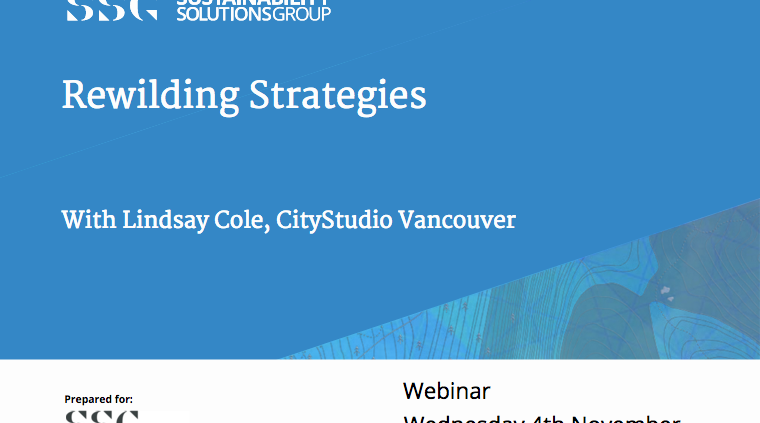 This time we will be hearing from Lindsay Cole, co Founder of SSG and now Operations Manager with CityStudio Vancouver, with some brilliant work in between (see her bio below). The session will be informal with plenty of discussion about Lindsays approach and work. Lindsay is a co-founder and former director with SSG, that left to take a position as the Greenest City Planner with the City of Vancouver. Upon completion of that planning and public engagement work, Lindsay moved to the Vancouver Park Board to lead the implementation of the Greenest City plan for that organisation. Her work included scoping and planning “Rewilding Vancouver: an Environmental Education and Stewardship Action Plan” for the Park Board, as well as the initial resourcing and implementation work. She is now the Operations Manager with CityStudio Vancouver, and is still connected to the Rewilding Plan (amongst other) City of Vancouver priorities. She’ll be briefly presenting the Rewilding Strategy, and looks forward to a lively discussion. Here are some links related to her work at CityStudio Vancouver and her Environmental Education Stewardship Action Plan for City of Vancouver. In our first in a series of Associate Webinars, Lindsay Telfer, Associate of SSG and National Project Director of the Canadian Freshwater Alliance will share an engagement methodology she has developed to broaden and deepen freshwater engagement across Canada. Here is the recording too for those who missed the session, or need to recap on all the information she shared with us! Lindsay Telfer, Associate of SSG and National Project Director of the Canadian Freshwater Alliance will share an engagement methodology she has developed to broaden and deepen freshwater engagement across Canada. In describing the approach she will reference case studies of her recent work building engagement for the new Water Sustainability Act in British Columbia and driving collaborative engagement around solving Lake Erie’s toxic algae problems. Lindsay uses an organizing methodology that builds a base of engaged support for change. Much of that approach is applicable for creating engaged communities for sustainability, whether it be community groups, municipalities and residents. Akin to “engagement organizing” the approach marries tried and test strategies in organizing with new technology tools to aid in broadening and deepening relationships with 100s or 1000s of supporters. The Freshwater Alliance is a national capacity building initiative that builds, connects and supports freshwater constituencies across Canada. Since 2008, SSG has been involved in sustainability consulting and LEED Certification for the socially-assisted housing project 188 East 1st Avenue. Listen in for ways SSG helped bring sustainability, efficiencies and wellbeing to this building and it’s residents.